Are you over 21 or a registered medical marijuana patient? The healing properties of cannabis are derived from hundreds of different compounds, the majority of which we are only beginning to understand; many others remain to be discovered. It’s an exciting time to explore cannabis for both novice consumers and cannabis enthusiasts alike. As the stigmas and misconceptions begin to disappear, conclusive evidence continues to emerge which proves that cannabis provides so much more than just a euphoric state of mind. Not only is cannabis useful for recreational purposes, it provides a myriad of both medicinal and therapeutic benefits that can be tailored entirely to meet your needs. For an in-depth look at how cannabis can fit into your life, read on. 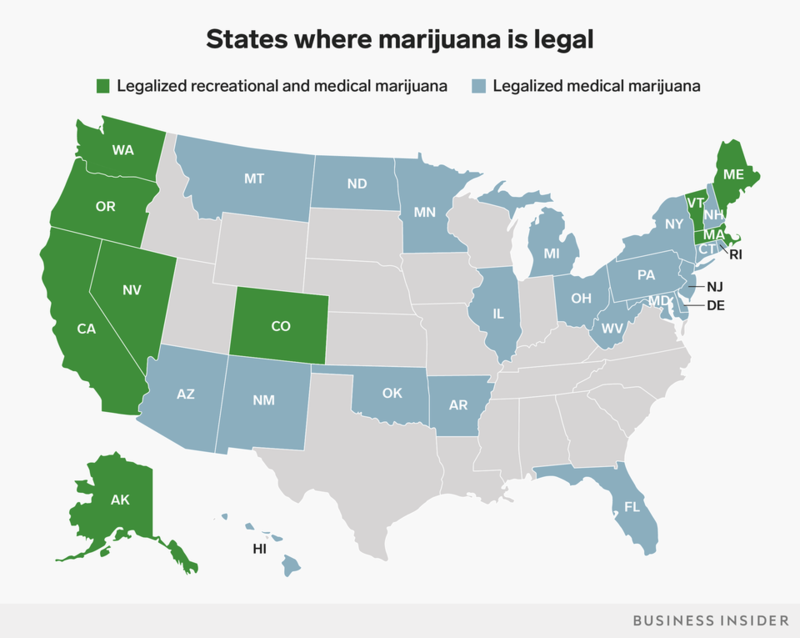 Currently, nine States have legalized both medical and recreational cannabis consumption. However, with legalization across Canada coming in to effect next month, and advocates across the U.S. fighting for cannabis access and decriminalization, more consumers will be able to enjoy the wide variety of benefits that cannabis has to offer. One person’s experience with cannabis can widely differ from the next due to a variety of factors; the most notable factor being how the compounds in cannabis interact with our own endocannabinoid system, which is unique to each individual and ensures that our body is running optimally. Because cannabis is so personal, the responsibility of understanding the effects of cannabis falls largely on the individual. This may seem daunting, especially for novice cannabis consumers. So to help, we synthesized the three different ways in which cannabis can fit into your lifestyle: medically, therapeutically, and recreationally. We hope that this will help you better understand how cannabis can meet your needs. But first, let’s go through a brief overview of cannabinoids, the compounds found in cannabis that bind with receptors in our endocannabinoid system to produce various healing and uplifting effects. Cannabis produces a variety of cannabinoids that can be useful for medicinal, therapeutic, or recreational purposes. The two most common cannabinoids are tetrahydrocannabinol (THC) and cannabidiol (CBD). THC is known for its psychoactive properties which produce a range of effects, from calming and relaxing to energizing and uplifting. In contrast, CBD is non-intoxicating – you don’t experience the mental high that is associated with THC, but instead you may experience what many call a body high. CBD is known for its ability to relieve pain, and for its anti-inflammatory and anti-anxiety properties. How you choose to benefit from and enjoy the effects of either THC or CBD, or perhaps a combination of the two, is entirely up to you. Cannabis has a multitude of medicinal properties that we are beginning to understand. However, we know for certain that it can be an effective alternative to traditional medicine and therapy treatments. Where cannabis enthusiasts and advocates have known this for years, Western science and medicine are only starting to catch up. According to Dr. Ethan Russo and Dr. Caroline MacCallum, there is enough evidence to prove that cannabis is an effective tool in treating particular complex diseases and rare conditions, i.e., multiple sclerosis, neuropathic pain (headaches and migraines), chemotherapy induced nausea and vomiting, and intractable seizures brought on by Dravet and Lennox-Gastaut syndromes, two forms of epilepsy. It’s also found to be an effective treatment for central sensitivity syndromes, such as fibromyalgia, chronic fatigue syndrome, and irritable bowel. This doesn’t mean that you should throw out all of your pills and start self-medicating. We simply want to illuminate the fact that cannabis can be used as an alternative or complement to Western medicine. Where pharmaceuticals tend to have a long list of negative and harmful side effects, the adverse effects of cannabis can be mitigated by proper dosage and responsible consumption. Emma Chasen, a cannabis industry consultant and expert, recommends that consumers try a ratio product to reap the full medicinal benefits of cannabis. THC actually elevates the effects of CBD because it binds more effectively with the CB1 and CB2 receptors in our endocannabinoid system. If you’d like to experience the benefits of cannabis with little-to-no psychoactive effects look for a ratio product that is higher in CBD to THC. Increasing the level of THC may be more effective for you in decreasing pain or reducing nausea, and the CBD will help to balance out the psychoactive stimulation. When consuming cannabis, start with a micro- or low-dose of 2.5 to 5 mg, and from there, monitor how you feel before introducing more or changing the ratio. You may not need cannabis to directly treat chronic pain or manage a disease or condition, nor are you interested in consuming cannabis solely for recreational purposes. Instead, you might seek to use cannabis as a therapeutic option, because, to put it simply, you’re looking for something that can make the reality of your day-to-day more enjoyable. 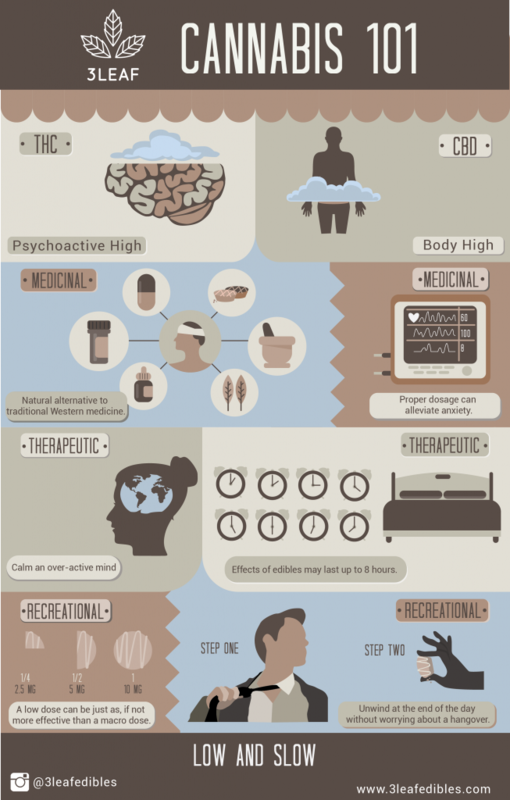 Sleep is an area where many consumers find cannabis to be highly beneficial. It’s often said that a good night’s sleep is the cure for just about anything, but a restful sleep is not always easy to achieve. Because of their long lasting effects, edibles make a great option for sleep aid. Where the effects of smoking cannabis usually last from one to three hours, the effects of edibles can last up to eight hours. Those who experience chronic pain or restless sleeps tend to enjoy edibles because it mitigates the pain and allows them to sleep peacefully. Products with higher THC content tend to be more effective when it comes to sleep, but a ratio product with 5 mg of CBD to 5 mg of THC is also highly effective. If you’re new to consuming edibles, night-time is the best time to try them out. And, it’s best to start with a low-dose, such as half of a 3Leaf Coconut Oatmeal Cookie or Quinoa Granola Bite the first night, both dosed at 10 mg per edible. Slowly introduce more each night until you find that your needs are met. Cannabis can also enable a healthy lifestyle. Some combine it with yoga, like one of our favorite LA-based yogis, Minelli, who regularly consumes 3Leaf edibles before, during, or after her cannabis infused yoga classes. Many enjoy cannabis because it allows them to quiet the over-activity of their mind so that they can better settle in to the present moment. Moreover, cannabis and both its medicinal and therapeutic properties can be highly beneficial for post-workout recovery. While most of the evidence is anecdotal, numerous professional athletes, fitness buffs, and members of 3Leaf’s own team attest to the fact that cannabis is effective in muscle recovery. THC promotes blood flow, which oxygenates your muscles so that they can recover faster; and, it also helps to promote relaxation, which can alleviate muscle strain and tension. You know the days where you walk through your door absolutely exhausted and spent? You throw your keys on the counter, only for them to slide to the floor, and all you can say is, “I need a drink.” Well, there are certainly days that call for a glass of red wine or a crisp gin martini, but cannabis can be a highly effective alternative to alcohol, and it may pose less of a health risk. Because of its anti-inflammatory properties, cannabis will actually benefit your liver. And, it’s next to impossible to feel a hangover from cannabis. There is a chance that you will feel drowsy after consuming a large dose, but a headache and nausea associated with overconsumption of alcohol are highly unlikely. THC is typically associated with recreational consumption because of its psychoactive properties which provide the feelings of euphoria. However, CBD can be just as effective in providing the ideal type of cannabis experience for you. Both can promote a feeling of relaxation, but THC will also provide the psychoactive high. High doses of cannabis are typically associated with recreational use; however, researchers and consumers alike have begun to realize that a low-dose can be just as, if not more effective when enjoying cannabis recreationally. A micro- to low-dose, between 2.5 and 5 mg, provides various effects that range from calming and relaxing to uplifting and energizing. And it is far less likely that you will experience adverse effects with a low dose of cannabis. Micro-dosing is a safe and effective way to incorporate cannabis into your lifestyle. As cannabis moves into the mainstream there is no doubt that more research and conclusive evidence will begin to emerge to illuminate its effects and benefits and make understanding cannabis less of a guessing game for the individual. In the meantime, it is up to the individual to understand how cannabis meets their personal needs. As you educate yourself and experiment with different consumption methods and doses we cannot stress enough the importance of low and slow: start with a low dose and wait to see how you react before adding more. With the proper dosage and the right consumption method, you are sure to find a cannabis experience that meets your needs. Thank you for taking the time to read our post. To find out more about our low-dose, high-quality edibles click here. Never miss out on 3Leaf news and exciting announcements, including the latest retailers carrying 3Leaf products. Be sure to join our newsletter, and follow us on Instagram and Facebook. 3Leaf edibles provide a premium cannabis experience. Our low dose products are crafted with the finest natural foods, combined with the highest quality cannabis extracts available. © 3Leaf 2019. All rights reserved.